Clouds Taste Satanic hail from Brooklyn, New York. Some members apparently were in a “post rock” group. They have one of the coolest band names ever, and I love this record! 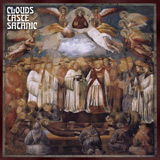 To Sleep Beyond The Earth is the debut recording for Clouds Taste Satanic, and also the title of the one 45 minute opus. To Sleep Beyond The Earth is stretched into four parts, assumingly so it can fit onto vinyl. If you like 90’s era Earth than you will absolutely love Clouds Taste Satanic. Do not misunderstand that though, this is no cop out, Earth worship here. I am sure that they all have a copy of Earth 2 in their collections, but they take that simple perfect formula, and really build upon it making it something of their own. If you really look at the title even, at least from my eyes it is a homage to 90’s heavyweights Earth and Sleep. A lot goes on within the 45 minutes of To Sleep Beyond The Earth. Drums are present, which gives a pulse to the song, keeping it unique, and adding that extra dimension that can leave other “one long song’s” lacking and sounding dull. Being an entirely instrumental band you must convey your message without the ease of having a singer speak or inform the listener of the bands intent. Many instrumental bands fall into the trap of having good music, but it just goes nowhere, endlessly noodling, tempo changes, and other tricks of the trade that seem to just be added in to take up time. Fortunately Clouds Taste Satanic keep things interesting forgoing these instrumental templates, and create a very intense listen. They do break the tempo from time to time, even going into some “dreamy” passages. All this works to great effect however as the music is stellar enough to stand on its own. Their name pretty much sums up their intent also, while they may not adorn themselves with robes, or go on stage with goat masks, I am sure there is an affinity for the dark lord, and sonically they are able to put this out into the ether, creating an evil, doomy atmosphere. To be completely honest I absolutely love this record! I hate to just unabashedly gush over a piece of music, but when it’s good it’s good. Clouds Taste Satanic have created a record I have wanted to hear for quite some time and have never found since Earth 2. While I love straight up drone, sometimes there is not a lot you can do with it. Sunn O))) found a way to get past the trappings by going in a more arty direction. Clouds Taste Satanic have gone another path, they added the rock n roll element, and while they could be considered “arty” they lean way closer to the “rock”, and keep the musicianship complex enough without simply sustaining the same power chords over and over. To Sleep Beyond The Earth gives off the mellow vibe that you would expect from a 45 minute song, you can pick your poison, relax, and just get lost in the music. With schedules being hectic, stress, and all kinds of crap that modern life throws at you, it’s nice to lose a good chunk of time just being right in the moment, and I would suggest To Sleep Beyond The Earth to be the soundtrack to that.